World Winner is a unique online casino that prides itself in being a “skilling” arena where players from around the world are free to challenge each other to cash prizes. International players can sign up with World Winner by paying an entry fee that varies on the basis on the casino game they select. The terms of usage of World Winner and other GSN network casino portals are in accordance with the state laws for California, which means that users can enjoy thrilling online gaming here in a completely legal manner here. Continue reading our Worldwinner Review. The ultimate goal for players participating in World Winner casino games is to achieve the highest score. Deposits are charged to the credit cards of the players and then drawn on it to pay the entry fees. However, other modes of payment are also available with World Winner. There are plenty of marvelous casino games to choose from. Every World Winner review lauds how users have an equal chance to win at all games and earn lucrative rewards. The website is available primarily in English and is a part of Game Show Network (GSN), owned by DIRECTV and Sony Pictures Entertainment. The web-based casino interface and gaming site was launched way back in 1999 and being a part of GSN, is accessible from various countries in the world, including the United States. However, there are some areas in the US such as Arizona, Arkansas, Delaware, Iowa, Connecticut, Maryland, Vermont, Tennessee, or Florida where Internet users are unable to access the website due to the stringent gaming laws of the state that prohibit the contest setup format of World Winner. The website has already built up a sizeable and loyal fanbase thanks to the excellent performance of the software, the massive collection of casino games, fun and interactive game-play – the combination of all three factors capable of drawing in both amateurs as well as veteran gamblers. World Winner covers all the bases, allowing users to experience actual casino fun from the comfort of their own homes. A whopping range of promotions are available at World Winner, but you need to be a registered user in order to gain access to the bonuses. Signing up is free and the casino offers up over $500,000 in prizes on a daily basis. The prices tend to vary on the basis of the game that the user wants to play and the casino also provides plenty of opportunities to earn money, incentivizing game-play with attractive bonuses. The prizes given out by the website are usually cash amounts, which are deposited directly into the account of winner. The expected cash value of the prizes are disclosed at the beginning of the tournaments and they change based on the actual number of players in the game. World Winner provides you with the opportunity to become a Premium Club member. Premium Club users get access to increased benefits – they are able to exchange tips and strategies with other players, receive first-priority attention from World Winner Player Services, and also get to be the first to try out any new games on the site. Every time you play, you receive Premium Points, which can then be used to gain bigger rewards. World Winner prides itself on the security and safety of member information and establishes a safe and fair online gaming environment for players. The online casino gives players the opportunity to indulge in their favorite games from anywhere they want including their very own bed. This enables them to improve their skills and relax at the same time. World Winner already has its fair share of casino games enthusiasts from around the world and the result is a thrilling and fun game-play session, whenever you want it. Premium Club members have the extra advantage of connecting with professional players across the world. World Winner has no mobile version available at the moment to complement the website but thankfully, members will be able to access the GSN mobile app that is available for free download from both Apple App Store and Google Play Store. This version is the first-ever cash tournament casino site optimized for mobile phones available to players in the United States. Launched in 2014, the GSN Cash Games mobile site allows casual gamers to indulge in skill games on their tablets and smartphones that pay out real cash prizes. The mobile versions of the most popular gaming titles at World Winner bring the excitement of competing for cash prizes to players across the globe. The mobile version of the site allows easy and smooth navigation and protects the privacy of the users. Due to the integrated cross-platform support enjoyed by World Winner, the mobile version happens to be the correct choice for the insatiable gambler who is frequently on the move. In terms of design, World Winner has some of the best casino games in the industry and they are not only eye-catching enough to lure new players to the website but also possess interesting features that increase the play-worthiness of the games. They provide hours of fun, and you can try out the free version of any game in order to get an idea about whether it is the right selection for you or not. Accessing the website is easy and the interface is smooth and fast. There are well-organized categories of games, such as Card Games, Arcade Games, Strategy Games, Word Games, and Game Show Games; simply click on one and you will be directed to the target page. You are able to socialize with the online casino environment by navigating the Account Page, Game Rules, and Premier Club sections. The View Games section is where all the games are organized for the benefit of the users into neat sections, and the daily prizes are showcased. World Winner does not cater to children under the age of 13. The website actively discourages users below 13 years of age from signing up for the website, and in case a kid over the age of 13 but under the age of 18 enters the site, World Winner encourages them to play the casino games with the permission and the supervision of their guardian. The site operates out of Boston, Massachusetts and everyone can play for actual money. Responsible gaming is one of the concerns of the website and in addition to its no-minors policy: World Winner also discourages compulsive gambling. Players use credit cards to fund their activities on the website and World Winner reserves the right to impose dollar amount limitations on the credit card transactions of the users. The site can also impose restrictions on the total amount of dollars that may be won or lost in the course of a game during any calendar month. Once the player’s losses hit the designated limit, they may be restricted from entering cash tournaments until the next month. Payments can be made through a PayPal account or credit card. Unless it is expressly noted on the website, all tournaments involve actual cash entry fees and the site retains a certain portion of the aggregate total in the form of tournament hosting fees and/or management fees. Registered users of the website can access and enjoy numerous casino and card games, including Solitaire and Freecell. 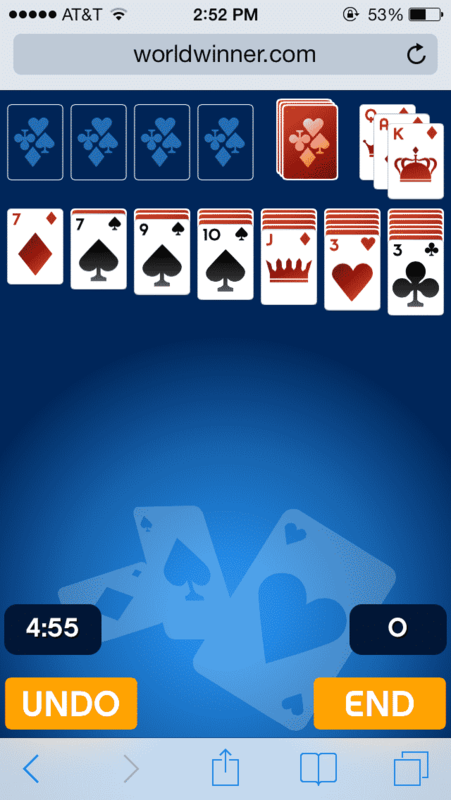 Solitaire Rush has historically been the most popular game in the site. There are some interesting additions to the games line-up at World Winner, which helps differentiate it from its competitors, in the form of crossword puzzles, checkers, and chess. You can also try out the fun dart simulation. World Winner has made it a point to bring all these diverse games under a single platform so that your entertainment and gambling needs are fully met. A unique aspect of World Winner is the free version of the games that the online casino allows players to indulge in so that they get an idea about the kind of gameplay in store for them. This provides them with the opportunity to test any game from the site without first going through the hassle of signing up. Depending on your gaming preferences, you can choose to either sign up for the game and access all the features or try out another game. This option serves newbie players very well. Unlike other casino websites, the main draw of World Winner is the site’s cash-prize games that allow the players to compete against other fellow gamblers from different parts of the world, instead of playing against a computer and relying on blind luck. It allows serious gamblers to flex their gaming muscles and let loose their skills on the field and provides amateur players with a wholesome idea about what they can expect when they play an actual casino game. This has always remained World Winner’s USP and has brought unprecedented success to the site. World Winner has established a long-standing reputation in the online casino industry thanks to the fun and entertaining gameplay that allows users to take a break and relax after a long day at work while earning some money in the process. There are lots of popular casino games to look forward to at the site along with a few uncommon ones that are sure to have their own niche following. A part of the GSN family, World Winner is already one of the most well-known virtual casinos across the cyber-sphere and the site values the privacy and safety of the customers. "WorldWinner.com is one of the leading Skill Games portals, where players can enjoy playing for real money."